I predicted a few weeks ago that Arab upheavals might inspire Palestinians to shift "away from warfare and terrorism in favor of non-violent political action. That could include massive non-violent demonstrations such as marching on Israeli towns, borders, and checkpoints." Right on cue, on what Palestinians call "Nakba Day," a rejection of Israel's gaining independence on May 15, 1948, mass activity took place in a coordinated and unprecedented fashion today. A New York Times headline aptly summarizes events: "Israel Clashes with Protesters on Four Borders," being those of Lebanon, Syria, the West Bank, and Gaza. 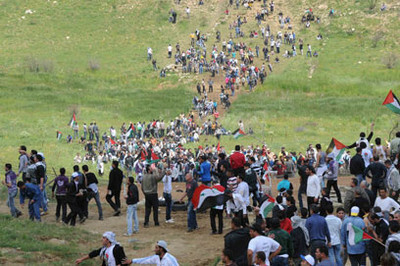 The most serious incident was on the border between Syria and the occupied Golan Heights, where thousands of protestors gathered on the Syrian side and hundreds flooded into the Israeli-held territory after flattening the border fence. Scores entered the [Israeli-controlled] Druze village of Majdal Shams, gathering in the central square, where they raised Palestinian flags. But, being Palestinians, they could not resist resorting to violence, thereby perhaps undercutting the whole effort. According to an account in Yedi'ot Aharonot, the Syrians trampled the border fence, hurled stones at Israeli troops, wounding ten, and left Israel by early evening, shouting out "We'll be back" to the applause of local villagers. Syrian subjects crossing en masse onto the Golan Heights without Israeli permission has never (to the best of my knowledge) happened before. And, of course, in totalitarian Syria, this sort of occurrence requires government approval. While one can ascribe this protest to Damascus's wanting to divert attention from its own internal problems, it also fits into a larger picture. Syrian subjects carrying Palestinian and Syrian flags as they approach the border with Israel. 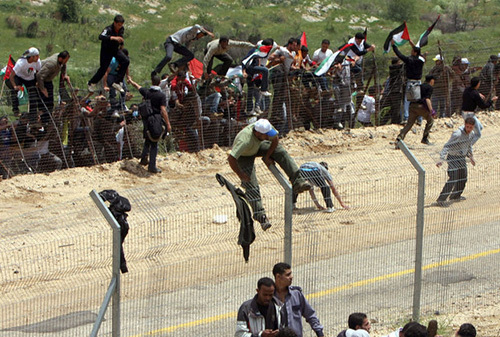 Something new: Syrians climb over the border fence to cross into the Golan Heights on May 15, 2011. Israeli troops on guard against the unpredictable influx. May 16, 2011 update: Hamas agrees with my assessment. Spokesman Sami Abu Zuhri describes yesterday as "a turning point in the Israeli-Arab conflict." Hamas leader Mahmoud al-Zahar adds: "This shows that the occupation can be toppled. The role of the people has proven itself. Next time, millions will participate." Some Israelis concur. Defense Minister Ehud Barak noted that "The Palestinians' transition from suicide bomber terrorism to mass demonstrations, deliberately unarmed, will confront us with challenges that are not so simple." Yoav Limor, military correspondent for Israel's Channel 1 television, observed that "The barrier of fear has been broken. The army has to prepare for a new reality and figure out what to do." Aluf Benn writes in Ha'aretz that "The nightmare scenario that Israel has feared since its establishment came true: that Palestinian refugees would simply start walking from their camps across the border, and with their own two feet try to realize the right of return." Alon Liel, a veteran Israeli diplomat, said the momentum is with the Palestinians. "This is a new type of enthusiasm around Palestinian nationalism, tied to the expectations in September." 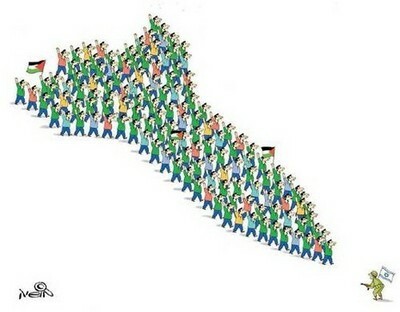 No one can say what form the revolutionary fervor currently sweeping the Arab world will eventually take in Palestine. It may very well be directed, first, against the centers of power in Gaza and Ramal­lah (Hamas and the Palestinian Au­thority, respectively; up-to-date studies show a sharp decline in popular sup­port for the former). Eventually, how­ever, the tide will turn against the Is­raeli occupation; the Israeli government has no effective response to a situation where hundreds of thou­sands of Palestinians decide to assert their freedom, one can hope, in nonvi­olent ways. I hope that some of us [Israelis], at least, will have the privilege of stand­ing beside them, sharing the risks, when that day comes. On Naksa Day, the Revolutionary Guard rallied Ahmed Jibril's Popular Front for the Liberation of Palestine - General Command to send hundreds of demonstrators to the border. "The background to the riots that broke out in the Yarmuk refugee camp the day after the demonstrations on the Golan Heights was largely the failure to pay the money that had been promised to the participants: $1,000 for each participant and $10,000 for anyone who became a 'martyr' - killed in the demonstrations," the source said. "The families of those killed were furious with Ahmed Jibril, whom they blamed for dragging their children to a confrontation with the Israelis. Hundreds took part in the demonstration because they had not been paid. Jibril's security guards feared that he would be harmed, and they opened fire, killing 14 residents of the camp. At the time there were senior Hamas figures in the camp." The senior Israeli source said the likelihood of similar demonstrations on the Israel-Syria border in the near future is low. A New Netanyahu vis-à-vis Syria?